Coventry has a long and interesting history ranging from the Roman Fort at Baginton to the spectacular new Cathedral designed by Sir Basil Spence, consecrated in 1962. The Benedictine Priory of St Mary’s was founded by the city’s famous Lady Godiva in 1043 and later became the first of three cathedrals, only to be pulled down on the orders of Henry VIII in 1534. The second cathedral was destroyed in the 1940 Blitz on Coventry, the ruins of which are now attached to the present one. St Mary’s Guildhall, one of the finest in the country, dates back to 1342. Here kings and queens were entertained, mayors inaugurated, bread handed to the poor and Mary Queen of Scots imprisoned. Princess Elizabeth, daughter of King James I and grandaughter of Mary, held court here when aged eight, while living at nearby Coombe Abbey and was hidden here during the Gun Powder Plot. Cheylesmore Manor House, still partially standing, was once part of the estate of the Black Prince and is the location of the city’s Registry Office. During Medieval times, Coventry was renowned for its cloth industry, later replaced by silk, watches, sewing machines, cycles and eventually cars. The city is the birthplace of Sir Frank Whittle, inventor of the jet engine, while George Eliot, the authoress, was educated here and her book ‘Middlemarch’ was based in Coventry. So next time you visit Coventry, come on a guided tour with a member of the Coventry Guild of Tour Guides and discover the real city. 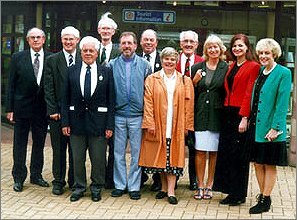 The Coventry Guild of Tour Guides has been in existence since 1990. All members have passed an examination with The Heart of England Tourist Board and have been awarded a Green Badge which entitles wearers to guide in the Coventry area. All guides have a good knowledge of history, while understanding how to look after groups of visitors and cater for their needs. Many of the fourteen members own costumes, allowing them to dress as famous characters associated with the city. These include Lady Godiva, Queen Isabella, St George, Black Prince, Henry VI & VIII, Nell Gwynn, John Hale and many others. 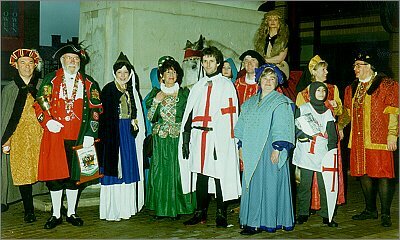 Costumes are not normally worn for day to day guiding, but are usually kept for special occasions such as the Godiva parade in June. On offer to the visitor are a variety of guided walks and coach tours, usually lasting about 1½ hours but can be extended if requested. The guides are also available to support local conferences and functions and have also been known to play a part in the odd medieval banquet and murder mystery! Prices are very reasonable and reflect services outside London. If you are interested in a quote or require further information, please feel free to contact us.